These checklists are dynamically generated from specimen records in the CPNWH Database. Although our database holdings are extensive, there are still some gaps at the county level and the checklists generated here will not include all taxa that occur in a county. You can help us fill the gaps by collecting and donating specimens to an herbarium in our region. 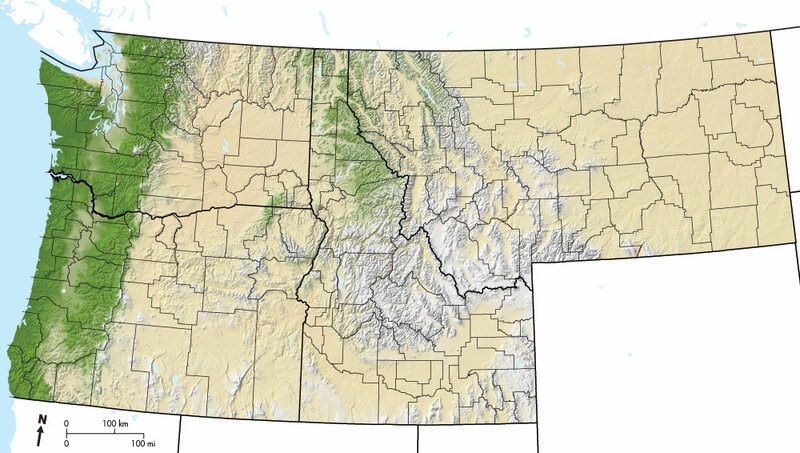 County maps are not available for Alaska, British Columbia, or Yukon Territory due to a lack of specimens attributed to a county, borough, or district. See also the Mobile Datasets page, which provides pre-compiled county checklists, distribution maps, and label data that can be downloaded onto mobile devices for use without a network connection. There is no limit to the number of counties you can select. However, a list with many counties will take time to generate and may not fit nicely on a printed page. Map image © 2011, Tom Ruehli. Data Sources: National Aeronautics and Space Administration, PRISM Group at Oregon State University (http://www.prismclimate.org) created 12 Jun 2006; state boundary data are courtesy of the U.S. Geological Survey.